If you're fan of the horror films of Britain's Hammer Studios you tend to have to make a few allowances for elements that the passing of time has rendered a little old-hat, from the blaring brass crescendos that accompany shock moments to the parade of now over-familiar classical monsters. As horror cinema they rely on sometimes well-worn motifs and narrative arcs, and viewed from a modern perspective are no longer all that scary. There are a couple of notable exceptions, both made in the late 60s. The first was the 1967 Quatermass and the Pit, which was followed in 1968 by what was once hoped would be the first of a series of adaptations of novels by author Denis Wheatley featuring the character of the Duc de Richleau, The Devil Rides Out. Unfortunately (and mysteriously), the film flopped in the US, killing any plans for further de Richleau films. 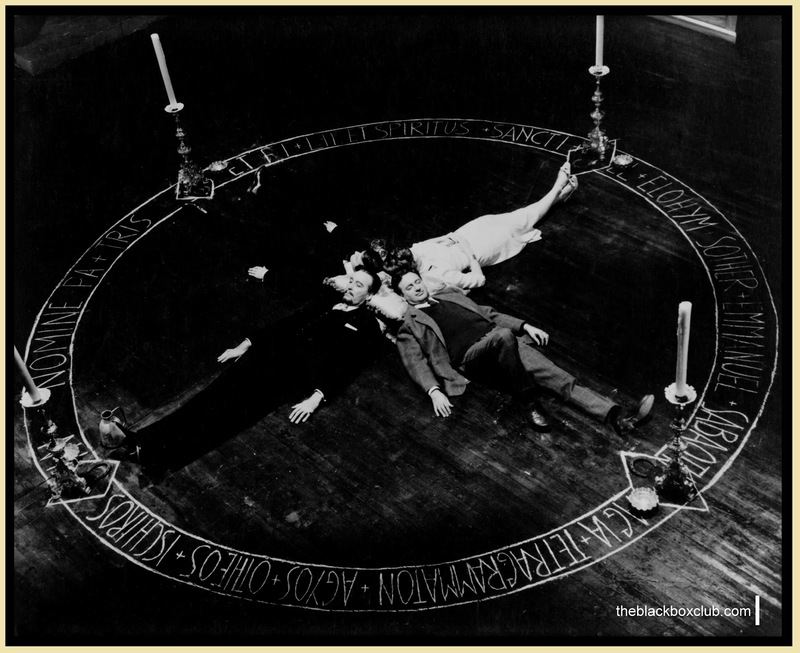 Which is a big damned shame, as while time has dulled the edge of some of the studio's output, The Devil Rides Out continues to shine as one of its very finest films. Now it's quite possible that some younger viewers will not be familiar with the works of Mr. Wheatley. Although the author of over 70 books, many of them thrillers or adventure stories, it is his occult novels for which he remains most famous. In their day they were chart-topping best sellers, tales of the black arts written with an almost scholarly eye for detail and authenticity. Parents doubtless worried about the harmful effects they might have on their children, who frankly lapped them up. This, for most of us, was our first exposure to the whole concept of Satanism and the occult, and as written in Wheatley's books it seemed both plausible and frightening, a long way from the more fantasy-based monsters of much of Hammer's late 60s output. The story unfolds with breathless economy. Arriving from America, Rex Van Ryn (Leon Greene, but with Patrick Allen's voice) is met by his old friend the Duc de Richleau (Christopher Lee) for their annual reunion. Missing from the party is the younger Simon Aron (Patrick Mower), who has recently broken off contact with de Richleau and acquired a large and secluded manor house. The pair drive to his home and find him in the company of guests and preparing for an unspecified evening event. In the course of exploring the upstairs observatory, Richleau uncovers evidence that Simon has become involved in black magic and is soon to be baptised as a disciple of Satan. Fearing for their friend's safety, de Richleau and Rex kidnap Simon and flee the house, but the covenant leader Mocata has no intention of letting his newest recruit escape his grasp. Tightly scripted by Richard Matheson and thrillingly directed by Terence Fisher, The Devil Rides Out hits the ground running and rarely pauses for breath. Two of the lead characters are introduced in the first minute of screen time and key information about the third is concisely outlined as they make their way to his home. Information is dispensed on the move and we are encouraged to read as much from what we see as what we hear: the striking international diversity of Simon's guests; the snippets of conversation overhead as de Richleau tours the room; one guest's concern there are more than thirteen present; the suggestively demonic design of the observatory's marble floor; de Richleau's alarm at the discovery of black and white cockerels concealed in a wicker basket. As de Richleau and Rex make their escape with the unconscious Simon, the pace is further accelerated by James Bernard's racy score, Arthur Grant's sometimes kinetic camerawork (the camera actually shakes when the manservant who tried to stop them is sent crashing through a table, as if physically responding to the violence of the action) and Spencer Reeve's scalpel-sharp editing (Reeve also cut Quatermass and the Pit and the Chimes of Big Ben episode of The Prisoner). With next to no build-up and the need to explain the details of devil worship to an audience for whom this was virgin territory (no pun intended), a fair amount of exposition is perhaps to be expected. But by keeping it brief and crucial to narrative progression, it never for a second plays like shoehorned-in explanation. It helps no end that de Richleau is played by Christopher Lee at his commanding and persuasive best, and that he delivers every line with the authority and conviction of a man who is utterly convinced of the truth and importance of his every word. And it just doesn't let up. As soon as one problem is resolved, another arises, adding to the sense that our trio – who later expand to include unbaptized circle member Tanith (played by French actress Nike Arrighi) and de Richleau's friends Marie and Richard Eaton (Sarah Lawson and the instantly recognisable Paul Eddington) – really are under relentless attack from diabolical forces. 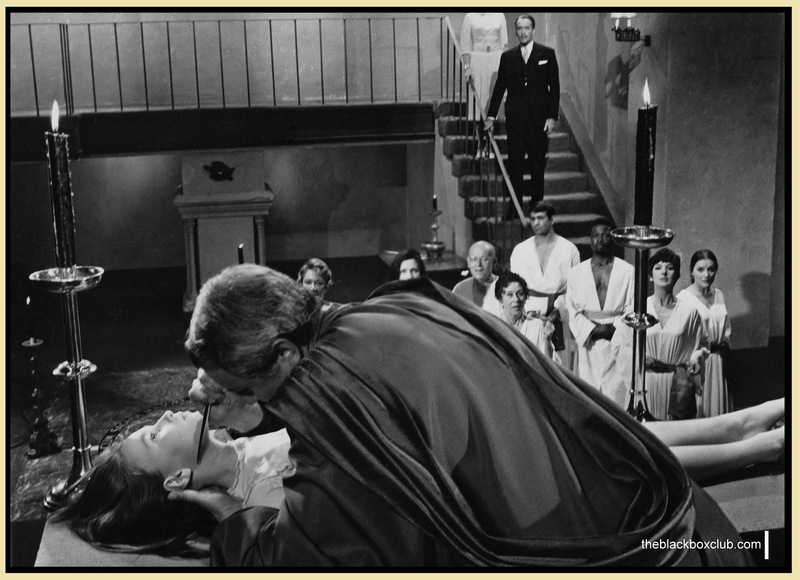 If the first half has a climactic scene, it's the open-air ceremony at which Simon and Tanith are to receive their satanic baptism, which although toned down by censorial restrictions – wild naked orgies were still a film no-no in 1968 British cinema – is realised on a surprisingly large scale. It also features one of the most memorable cinematic incarnations of The Devil, here in the shape of The Goat of Mendes (aka Baphometh for those with an interest in such things), a horned humanoid goat creature so impressive that all he has to do is sit on a rock and look regal to appear threatening. Marshalling the dark forces is the all-powerful Mocata, a gorgeously judged performance of smiling malevolence from Charles Gray, who infuses even gentlemanly politeness with unspeakable menace. In one of the film's most compellingly staged scenes, he visits and hypnotises Marie Eaton (a sequence in which neither of the two blue-eyed performers blinks even once) to force her to reveal the location of Simon and Tanith, both of whom – in a superbly suggestive high-angle shot – he then silently commands to murder their unwary protectors. When his efforts are disrupted by the sudden arrival of Marie's daughter Peggy, he is shown smartly to the door, where he delivers what could be the best implicit threat in horror film history: "I shall not be back," he casually assures Marie with a confident smile. "But something will." Astonishingly, this incident and action-driven first hour plays almost like a warm-up for a gripping third act in which de Richleau and his companions do battle with the forces of darkness from within a chalked circle in the Eatons' home, while Rex holds up in a barn with Tanith to prevent Mocata attacking the group through her. It's a relentless assault on the group's collective resolve that is shown exclusively from their viewpoint, which has the effect of trapping us in the circle with them, where we share their apprehension as the drop in the light level and their fear at the arrival of a giant spider and the winged Angel of Death. The special effects may not be as convincingly slick as top flight CG, but there is still something nicely organic about the results here, and the urgency of pace makes it hard to care too much about the odd flaw in the matte work. Only a thankfully brief shot in which the rearing horse of the Angel of Death is ping-ponged back and forth comes close to shattering the illusion, a curious decision whose artificiality borders on the comical. But this is a minor blip in an otherwise fabulous concoction that showcases the inspired partnership of Hammer, Fisher and Lee at the absolute top of their game. The effects, religious reverence and the scary-eyed African aside, it has also aged handsomely, and is as fast-paced and incident-packed as any modern day horror work and a whole lot classier than most. Even the black magic rituals and Latin incantations having a consistently authentic ring, being the result of historical research rather than fanciful imaginings. Despite some stiff competition, The Devil Rides Out is probably my favourite film from a studio on whose output fed my developing teenage love-affair with cinematic horror, and it remains one of only a handful of Hammer films that have been afforded classic status. In a break from the previous films in the Studiocanal series, the restoration of The Devil Rides Out was carried out by Cineimage, and in terms of picture quality they've done a spanking job, something I'll expand on in the sound and vision section below. What does need to be addressed separately is their work on the film's optical effects, which while technically impressive, does re-awaken the old and valid argument about tinkering with films whose makers are unable to collaborate on, approve of, or object to the changes made. Here the work has involved stabilizing shaky composite shots, cleaning up matte lines and regrading elements to achieve a closer contrast balance between matted elements and the footage on which they have been composited. More controversially, Cineimage have also replaced one effect completely (the lightning strike on the satanic altar), added elements to another (a water splash on the spider), and completed one one effect that was deemed to have been inserted into the film in an unfinished state, a close-up of the Angel of Death that was shot against a blue screen but never composited onto a background. Cineimage have added the missing background image, but one of their own creation, which may or may not match the intentions of Terence Fisher and effects man Michael Staiver-Hutchins. It's all seamlessly done and definitely polishes up the quality of the effects work, but this does mean that the version here is technically not the one that Fisher signed off on, and not the one that some of us were privileged to see on the big screen. If alterations like this are to be made, albeit with the best of intentions, it would be nice to be offered the opportunity to also watch the film in its original, unaltered form. Effects tinkering aside, the restoration work done here is consistently excellent, and the increased resolution and bitrate offered by Blu-ray enables a far higher level of detail and tonal richness than even the previously standard-setting transfer on the 2000 US Anchor Bay DVD could deliver. The film grain varies a little, but is for the most part unobtrusive, and the image itself is spotless, the result of restoration work that has removed over one and a half million instances of dust and dirt. The contrast is also very nicely judged, and while there is some minor quality variance, at its best – the open-air satanic baptism, with its vivid blue robes, inky blacks and crisp detail is a good example – the image quality is excellent. The linear PCM mono 2.0 soundtrack has some inevitable minor restrictions in range – there is no punchy bass here – but is otherwise clear and free of distortion on even the louder music and effects. There is only a faint trace of a background hum, and you'll have to crank up the volume to hear it. The commentary here has been ported over from Anchor Bay's twelve-year-old US DVD release, but you'll get no complaints from me. It's an excellent track in which Lee effectively holds court, appropriate given that he was the one who convinced Hammer that the time was right to make a film from one of Wheatley's novels. His extensive knowledge of the subject allows him to guide us through the origins of title sequence artwork and of the Latin used in the rituals, and he reveals that he was friends with Wheatley and that the author loved the film. Lee and Lawson share plenty of entertaining memories of the shoot, including the dubbing of Leon Greene's voice with that of Patrick Allen, to whom Lawson was married until his death in 2006. It's an information-busy and enthralling commentary, though Lee does enthuse repeatedly about the then proposed remake on the basis of its potential for more spectacular CG effects, which has repeatedly shown to be is a piss-poor reason for remaking any film of note. 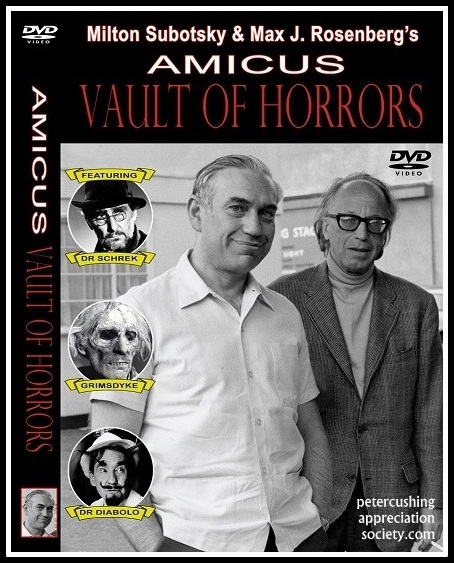 Another of the detailed and captivating retrospective documentaries that adorn the Studiocanal Hammer restorations, this includes interviews with usual suspects Marcus Hearne (who also directed), Denis Meikle and Jonathan Rigby, plus screenwriter Richard Matheson, actor Patrick Mower, Wheatley biographer Phil Baker, actor and writer Mark Gatiss (who admits that this was the only Hammer film that scared the pants off him), and Kitty and Dan Staiver-Hutchins, the children of special effects supervisor Michael Staiver-Hutchins. David Huckvale once again deconstructs the score and reveals that the final angelic chords were selected by composer James Bernard to be played at his funeral. An entertaining and informative half-hour. And here is where Hammer purists are likely to have a few problems, as members of the Cineimage restoration team explain in detail how they have cleaned up and in some cases reworked the film's optical effects. Fascinating on a technical level, the issue of whether what can be done should be done is never really broached, despite the undeniable polish of the results. Wheatley biographer Phil Baker leads a concise look at the three Hammer adaptations of Dennis Wheatley's work, from the 1968 double of The Devil Rides Out and The Lost Continent to the 1976 To the Devil a Daughter, a film Wheatley so despised that he apparently forbade any future adaptations of his work by the studio. Another episode from the series World of Hammer, this one taking an overview of the studio and its more successful films. Unfortunately, like the episode on the Quartermaster and the Pit disc, the sound mix is a shambles, with Oliver Reed's narration confined to the left speaker and effectively drowned out by the full volume film extracts on the right. Without fiddling with the balance controls, you'll have trouble making out what Mr. Reed is saying. A rolling gallery, set to music, of posters, press materials, front-of-house and production stills. Oh, this is a tricky one. A bona fife horror classic looking better than it ever has and with a fine collection of extras (save for that sound mix of the World of Hammer episode), it's a disc I'd be wholeheartedly recommending were it not for the enhancements made to the optical effects. I'll admit straight up that the work has been done carefully and respectfully and that it does not detract from the film in any way. But the simple fact is that these enhancements were undertaken without the involvement of the director or special effects supervisor, both of whom have long since passed on, and if I'm going to presented with an enhanced version of the film, I'd prefer it to be clearly labelled as such and have the option to view the film as it was released. Recommended, but with reservations. Am actually quite excited about the new fx additions. Wish the original version was included too though. Since when digital cleaning technicians are allowed to make changes in what are already classic artworks? As a film purist and a longtime fan of this horror icon, I definitely think this is unforgivable, and they can keep their restored BluRay for all I care. If these amateurish meddlings had been added as extras,it might have been different. Offering only the modified version (thus attributing themselves the status of filmmakers) is preposterous. PETER CUSHING: HAPPY HALLOWEEN : UK FB FAN PAGE.